I found a post that was lost in my vault of un-published drafts...It's from 5 months ago. Oops. But I love this simple recipe & I think you will too! It makes the perfect Holiday cookie recipe! A few weekends ago, I had a few hours to whip up simple desserts for a birthday party & engagement dinner. I decided to bake cookies due to the time constraint - they bake & cool the quickest - and they're the simplest to transport. So I thought I'd attempt to make both Rolo-stuffed chocolate cookies and Oreo stuffed chocolate chip cookies for the first time. I also thought it'd be wise to not follow recipes and hope for perfect cookies. Umm...yea, I never learn. Sadly the Oreo stuffed chocolate chip cookies did not turn out as I expected, so I will not be including them in this post, BUT I will work on perfecting the recipe to share with you later. Thankfully, the Rolo-stuffed chocolate cookies turned out to my liking and they were SO simple! 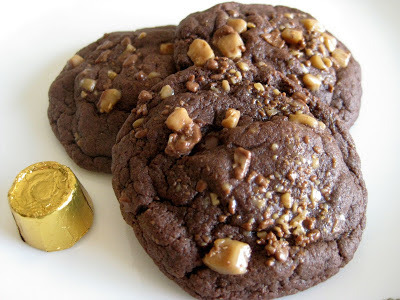 Due to my time constraint and, well really, my laziness, I chose to make the cookies from a Devil's Food Cake mix and worked with the recipe I used for the Andes Mint Cookies. The cookie dough only requires washing ONE bowl and few utensils! Can you blame me? I also wanted to make them a little more special and topped them off with sprinkles of crushed Heath bar! So here it is folks, I really hope you try this & add your own little variations like I did (be sure to comment below if you made this with unique additions!). Preheat oven to 350°F. Prepare a baking sheet by covering it with aluminum foil. Mix together the cake mix, eggs, and oil. 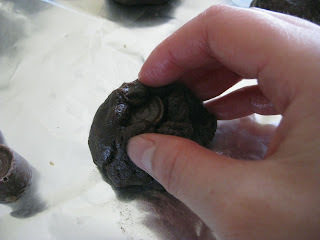 For cookies, I like to mix with my (washed) hands or a fork since the dough is thicker. 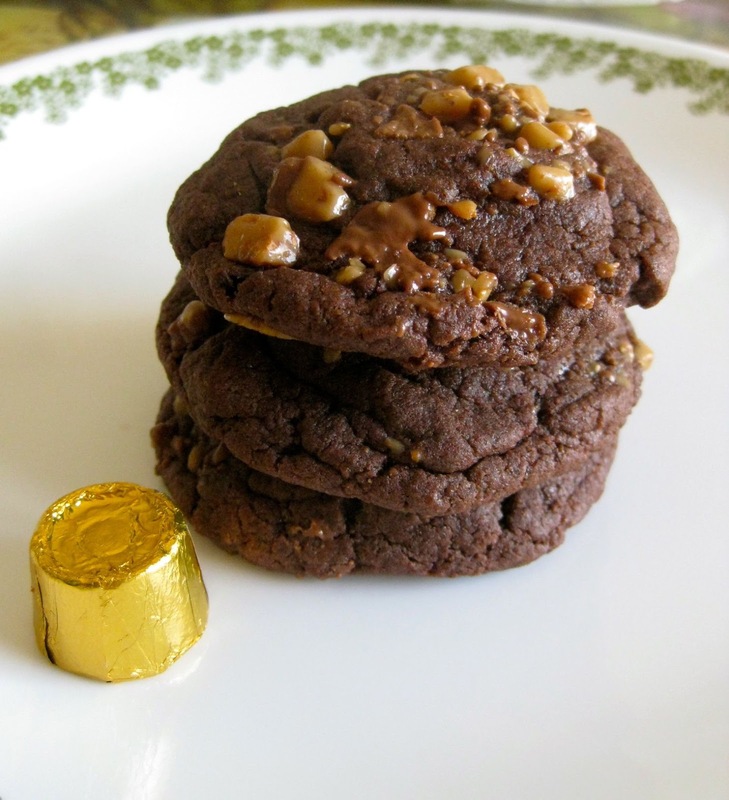 Once everything is well-incorporated, take enough dough to cover a Rolo. Roll the dough into a ball and then flatten it a bit. Place a Rolo in the center of the dough and work the edges of the dough up to cover the Rolo. If you have any excess dough, just pinch it off the top. 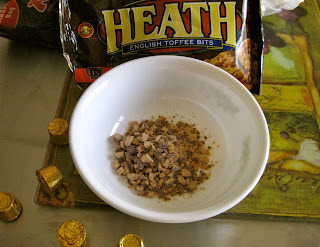 Then, I poured enough crushed Heath Bar pieces into a small bowl and rolled each dough-covered Rolo balls to cover them with Heath bits. 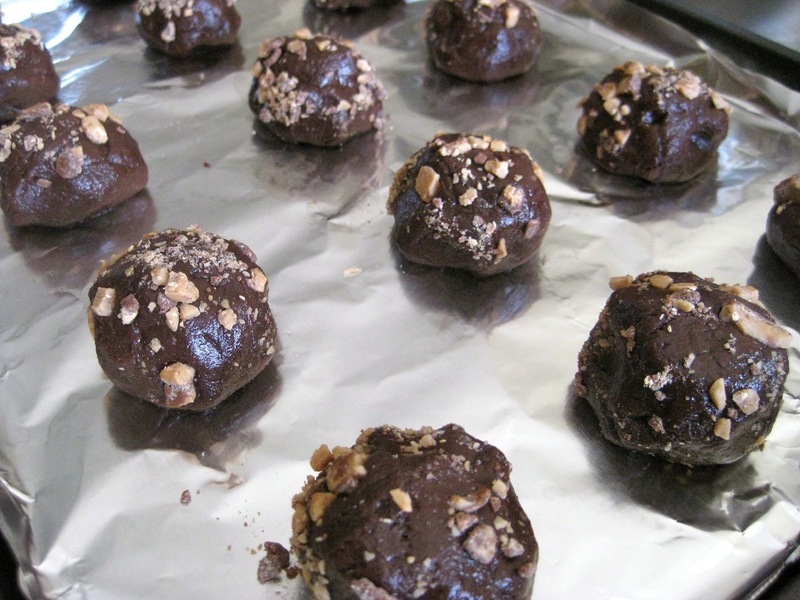 Place them a few inches apart on the cookie sheet because they will spread. Pop them into the oven for 7-9 minutes. 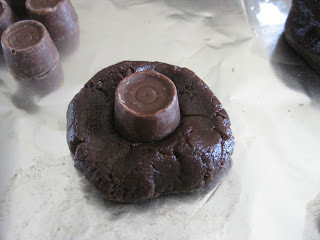 Remove them from the oven, let them sit on the cookie sheet for 10 minutes and then using a spatula, transfer them to a wire cookie rack to cool thoroughly.